Make America Dinner Again guest Affan Khokhar (left, seated) talks with hosts Tria Chang and Justine Lee (front right, seated) after the dinner as guests (from left to right) Afam Agbodike, Walter Rodriguez and Nick Tucker continue their conversation. After the upset results of the presidential election, some people felt motivated to become politically active. Justine Lee? She got the urge to host a dinner. But not your typical dinner party, where, if politics seeps into the conversation, things typically don’t turn volatile because all the guests likely share the same views. No, Lee was interested in the opposite: a gathering over a meal where all sorts of perspectives get aired. 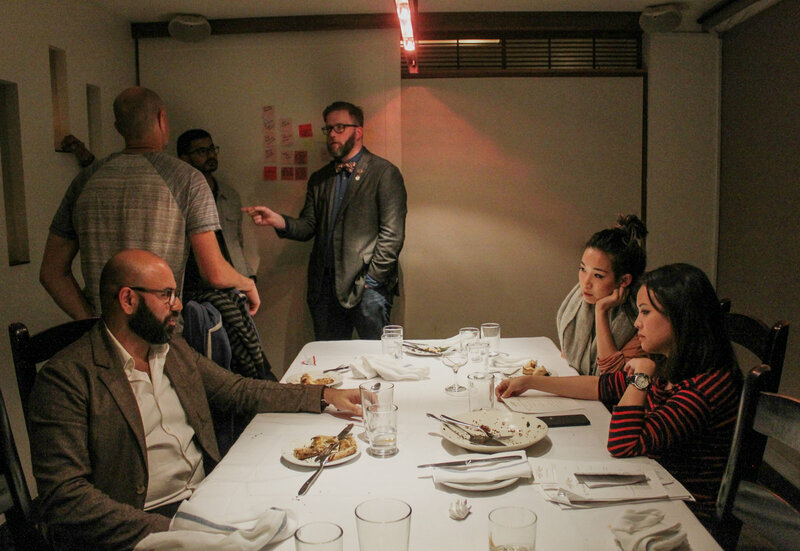 So Lee, a marketing professional, teamed up with her friend Tria Chang, who works education technology, to launch “Make America Dinner Again,” a series of dinners in the Bay Area that brings together strangers whose views range the political spectrum. They figured that a dinner is a warm and non-threatening way to chew on different ideas and have diverse opinions co-exist. While some people they invited had the opposite reaction, careful planning and gentle wording helped them convince others. 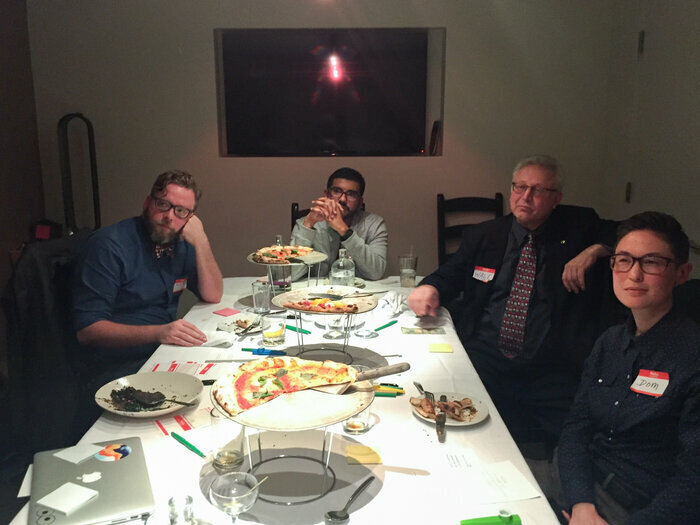 At the first such gathering, in late January, they gathered 10 people, including themselves, at Local Kitchen & Wine Merchant, a swanky pizza restaurant in San Francisco. Tucked into a private room, they reveal a bit of their histories as they start to talk politics. Among the dinner guests is Walt Shjeflo, an attorney originally from North Dakota. “I voted for Trump,” Shjeflo reveals, “but the vile statements surprised me,” referring to the reactions from his liberal friends after the election. Another guest, Rachel Williams, heads diversity at Yelp. “Eight years of a black president does not excuse or erase 400 years of slavery and oppression and all that,” she told her fellow guests. And Affan Khokhar, who works at a technology company, is a first-generation Pakistani-American who was raised in a Muslim family. He grew up in a Trump stronghold in New Jersey, but he says he’s never tested politically in the very liberal Bay Area. “I mean, it’s pretty much just like my Facebook [feed] living in front of me,” he says, referring to the liberal bubble of the Bay Area. As the guests dine on margherita, mushroom and pepperoni pizzas, organizers Lee and Chang pose questions to stir discussion. The group quickly delves into different issues that strike a personal chord. At one point, Shjeflo compares North Dakota with the Bay Area when it comes to certain struggles. “You know anybody who looks like me?” she asks. Alongside the dinner’s larger group discussion is time set aside to talk in pairs. Dom Brassey, an LGBTQ activist, says her own reaction to hearing Shjeflo’s more conservative opinions was a wake-up call. They all agree that this dinner is one way to speak and listen rather than argue. But, while it remains cordial, no one has a complete change of heart in the end. Khokhar says what he realized most during the dinner has more to do with himself. “You only learn from testing your beliefs, defending your beliefs, being able to be coherent and articulate about your beliefs — and being challenged,” he says. The hosts of this event have created an online guide for people around the country who want to organize something similar — so people anywhere can try to Make America Dinner Again. This piece originally published on NPR’s The Salt on March 4, 2017, and aired on All Things Considered on March 12, 2017.